Bringing together works by Salvador Espriu, Juan Goytisolo, Mercè Rodoreda, Esther Tusquets, and Juan Marsa that portray memory as a disorienting narrative enterprise, Colleen Culleton argues that the source of this disorientation is the material reality of life in Barcelona in the immediate post-Civil War years. Barcelona was the object of harsh persecution in the first years of the Franco regime that included the erasure of marks of Catalan identity and cultural history from the urban landscape and made Barcelona a moving target for memory. The literature and film she examines show characters struggling to produce narratives of the remembered past that immediately conflict with the dominant version of Spain's historical narrative formulated to legitimize the Civil War. 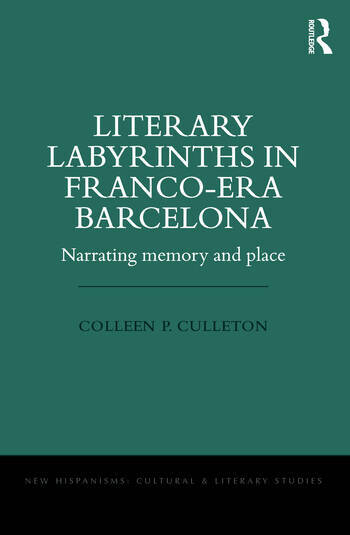 Culleton suggests the trope of the laberinto, used as an image or device in all five of the works she considers and translated into English as both maze and labyrinth, opens up a space that enables readers to take vulnerability to outside interference into account as an inseparable part of remembrance. While the narratives all have maze-like qualities involving a high level of reader participation and choice, the exigencies of the labyrinth with its unicursal demands for patience, perseverance, and faith always prevail. Thus do the Francoist narrative and social structure in the end resurface and reassert themselves over the narrating character's perspective. Colleen P. Culleton is Associate Professor of Spanish in the Department of Romance Languages and Literatures at the University of Buffalo (SUNY).